The market of SaaS shopping carts seems to have plenty of dominant solutions that control a major chunk of the e-Commerce market - Shopify, Bigcommerce, 3dcart, Volusion and some others. That doesn't stop new players from entering the competition, however. Some of them fail while others keep being promising, as Prestashop Cloud and Merchium are. The second one, actually, will be a the subject of our today’s overview. Having a catchy name and suspiciously familiar logo, Merchium has bursted in the world of e-Commerce less than a year ago and acquired more than 3,500 of customers already. And that’s focusing on a local market only. So, what are the prospects of this promising solution and how can it oppose to competitors? Look for the answers in our Merchium review. 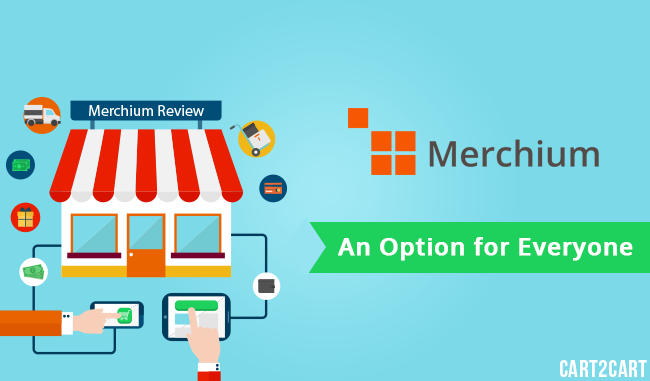 Merchium is a full-featured e-Commerce solution based on CS-Cart platform, and able to function independently or integrated with a Facebook page, WordPress blog, Joomla, Wix, Weebly, or any custom website. Actually, it copies all the advanced features of CS-Cart with one main difference - Merchium is hosted. Being an Australian startup initially, the software was almost entirely built by Simbirsk Technologies (Simtech), a Russian company behind CS-Cart. That mostly explains all the similarities the platforms both possess, including a familiar logo of “cubic” shopping cart. For its part, Australian side looks after operations for the Asia-Pacific region, mostly sales, marketing, and strategy. Another interesting thing about Merchium is the fact that it was developed in partnership with Yandex, #1 in Russia the 4th largest search engine worldwide. The result of such cooperation will be a deep integration with Yandex services, somewhat similar to Google’s ones. This feature, however, only makes sense when you’re aimed at the market of Russia or Eastern Europe. As a pleasant exception among hosted solutions, Merchium offers a high level of design flexibility with no HTML or CSS skills required. It has it’s own on-site visual editor that easily lets you change the color scheme of a storefront, backgrounds, fonts, and many more. Also, since Merchium can be easily pinned right into any custom website, you can create a specific layout and choose a style for every location you have a storefront at. Thus, your store is guaranteed to fit perfectly wherever you need: WordPress, Joomla, Wix, Weebly, a Facebook page, company's website, and so on. Of course, Merchium has a responsive design. In a pursuit of creating a top-notch UX, the solution was designed with a touch interface in mind, utilizing familiar touch gestures. With the storefront developed by Twigmo absolutely from scratch, shopping cart looks stylish and convenient on mobile devices of any size. 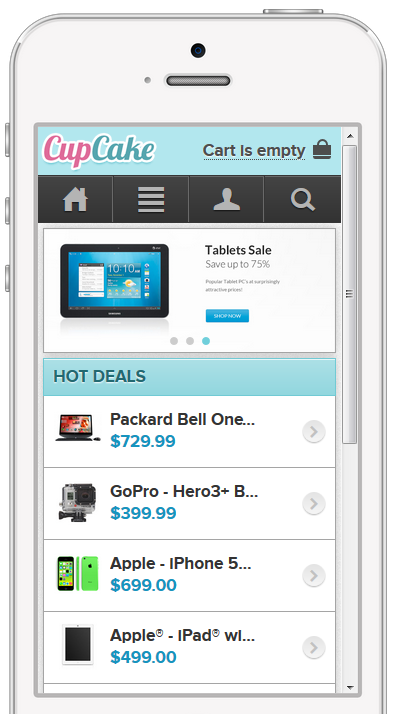 Merchium allows to increase your sales by going multichannel. The tremendous potential of Facebook will work for you with the ability to embed the store right into a personal Facebook page. Your catalog and orders will be immediately synchronized across all your storefronts, giving you another effective way to reach the customers. Getting social is now easy! Is the local market too tight for you? Merchium is ready to help you go global effortlessly, supporting 45+ payment gateways straight out-of-the-box and accepting payments with credit cards, PayPal, and other popular options. Integrated with such shipping services as FedEx and USPS, Merchium accurately estimates shipping rates on the go. Also, the solution is localized into a dozen of languages and easily lets your customers switch between currencies with real-time prices calculation. The pricing policy of Merchium is very democratic. There are 4 offers starting from a completely free one (not a demo version, but a permanently functioning store!) to an Unlimited plan for $128/month. Free 15-day trial is also available. Premium plan at a cost of $64/month is fairly the most advantageous solution for relatively small online retailers. Unlimited plan is twice as expensive and would be an optimal solution for middle-sized stores. One of the best things about Merchium is that, unlike some other hosted platforms, it has 0% transaction fee on all plans. It adds a sufficient amount of transparency to the pricing: if you’ve chosen a Basic $32/month plan, you will, most likely, pay no more than that. Here you can find out the what features are provided by each plan in particular. From beginner to a pro, Merchium is an option for everyone. Having such important competitive advantages as 0% transaction fees and easy multi-channel commerce, it is actively getting more noticeable on the market of hosted solutions. As the matter of fact, Merchium is currently deploying a broad marketing campaign aimed to grow the client base across the Asia-Pacific and the United States. And having such a good start on the local market of Russia, we’re sure the platform is fated to become an influential player of the global scale, just as CS-Cart is. Moreover, we’ll help Merchium to start its global offensive and suggest you to come along. From now on, Cart2Cart supports an automated Merchium migration from more than 60+ world’s most popular shopping carts! Move your products, categories, customers, orders, currencies, taxes and other entities to Merchium in a snap and with no programming skills required! Willing to try everything out beforehand? Start with an absolutely free Demo Migration!